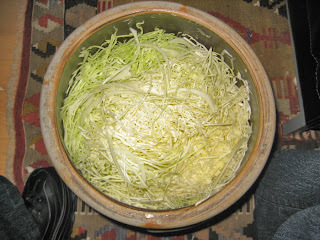 I make sauerkraut about once a month, in cabbage season (about July through December). Traditionally, kraut is only made in the cooler months- but since I ferment at room temperature, I'm not constrained by weather. 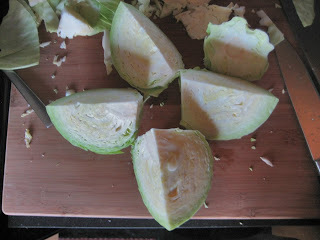 First, I quarter and core the cabbages. I like to quarter first because it makes coring easier. Next, I weigh the quarters. 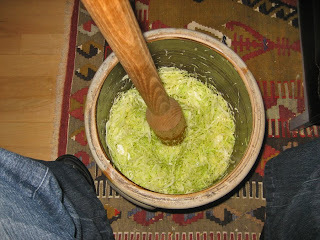 Typical kraut-to-salt ratio is 5 pounds of cabbage to 3 tablespoons salt. Be sure to use canning salt, not table salt. Shredding is next. Yes, it takes a long time, but this shredder works great. 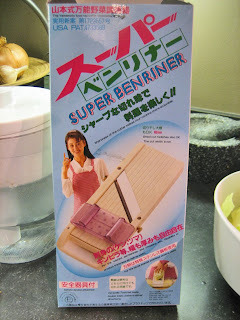 It's a Japanese "Super-Benriner" shredder- fabulous artwork on the box. Here's the first 5 pounds shredded in the crock. It goes nearly to the top. I shred 5 pounds at a time, add the 3 tablespoons of salt, then stomp away. Here's my kraut stomper. It's about the size of a baseball bat, but flat on the business end. I found this stomper in an antique store last year, but you can get them new from Lehman's. Stomping is absolutely the most important step of making kraut. If you don't stomp it, you'll just have salty shredded cabbage. I stomp for at least 20 minutes per 5-pound batch. I stomp until it sounds really squishy and looks translucent. Here it is after it's been stomped. See how much the volume is reduced? 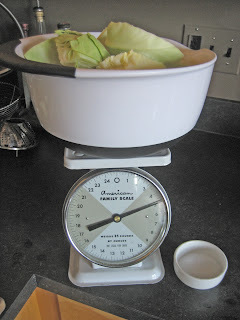 After all the cabbage is processed, "plate it and weight it" just as you would any lacto-ferment. While cabbage (especially freshly picked cabbage) does release a lot of it's own juice, it's rarely enough for the one or two inches of liquid you need above the plate. I usually add about two quarts of filtered water with 3 tablespoons of canning salt per quart- same ratio of salt you'd use in any fermenting vat. FYI, this vat is a 4-gallon vat. Some people don't spice their kraut, but I use garlic and juniper berries. Be sure to cover the vat to keep out the critters and dust. I use a piece of clean muslin (it needs to breathe) and a rubber band to secure it. 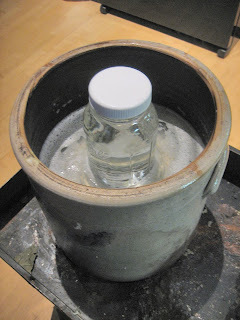 Store the vat in dim light or in the dark. I don't add any vinegar. Once you add vinegar (and heat if you're canning), the beneficial bacteria die. Instead, I store it in quart-sized canning jars in the fridge. If I had a root cellar, I'd store it there. But we eat it quickly, so storing is not a huge issue. Now, there's always some cabbage left over- the finger guard that's supposed to let you get down to the nub of the vegetables doesn't really work for me. 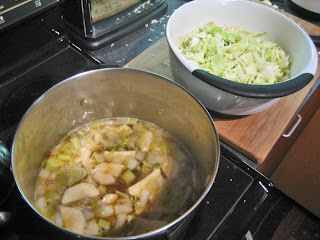 So I make cabbage soup. Typical Russian recipe, but instead of dill and marjoram, I use fresh sage and smoked paprika. Those two are such a great combo with cabbage and potatoes. That's all there is to sauerkraut. It's a time investment- usually takes all afternoon- but it's so totally worth it. 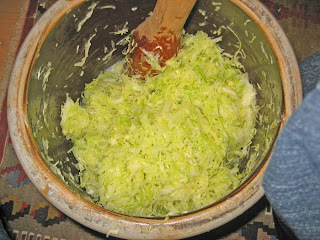 We have always made sauerkraut in the summer when the cabbages are ready. 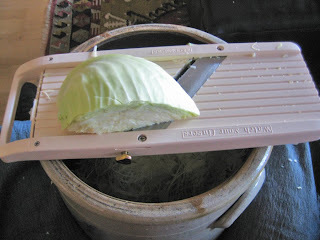 The crock then sits in a shady spot for the 'kraut to make. Then we can it. YUM! But, I absolutely hate store bought kraut! I've always wanted to make sauerkraut like I ate in the Czech republic, so thanks for this demonstration. When we were there every dish came with some white and some red. Bought jars of it are always fiercely sour. One day I'll get round to making it! So, is canning salt the same as Kosher (un-iodized) salt? What makes it different and why does it matter to the process? Thanks for mentioning the mashing part... all the sauerkraut recipes I've read didn't mention anything about mashing it. I never stomp, not sure why you think it helps. Mine came out great. Cabbage makes it's own juice just fine. I could see that the stomping step might be fun, though. CL, it's as close as you'll get to Eastern European kraut. The addition of vinegar in commercial kraut (for anti-spoilage) makes it more sour. For an even milder kraut, I sometimes rinse mine in water first. All depends on what I'm serving it with. Mariah, canning and kosher salt are interchangeable- the only difference is that canning salt is usually granulated, so measuring is more accurate (but in small batches, kosher salt is plenty accurate). You just don't want the anti-caking and iodine additives in table salt in your fermenting or pickling. Great therapy and great food! Can't wait to try this someday. I tried making kraut and we were not on the same page. I like the ideas of not adding vinegar and of the stomping. Thanks for the tutorial. Our green tomato jam is probably similar to your green tomato cheese, but maybe not cooked for as long. I've put the recipe on my blog now. just curious about letting it breathe? I thought lacto fermentation was an anaerobic process? Owl momma, it's anaerobic under under the brine, and under the weight and plate. But the vat needs to off-gas- it gets bubbly under there. Oh you had me at Lehman's. I love browsing thorough that store when we go to Amish country!